Towns throughout eastern Newfoundland are picking up the pieces Sunday, following a day of extreme winds that caused significant power outages and damage to property. 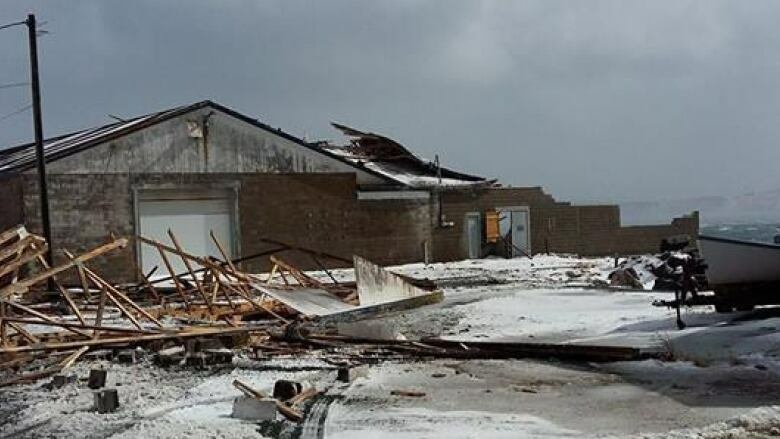 Ferryland mayor Adrian Kavanagh said much of the community is still surveying the damage, however the town's former fish plant sustained some serious damage from the gusts. "The roof let go and blew off, along with concrete blocks and everything, which covered a portion of the road and eventually we got cleared away, but the winds never let up yesterday," he said. Kavanagh said the rear extension of the building received the brunt of the damage, and that the main building at the plant remains intact. He added that a private investor already had plans in the works to repair the old property. The strong winds also brought whiteout conditions and knocked out power, leaving the community in the dark Saturday afternoon until early Sunday. Kavanagh said a fishing stage was also damaged by rough seas. He said he and many others in Ferryland had never seen winds as strong as what blew through the town on Saturday. "I talked to one resident yesterday, and he told me that as long as he's been here, he's never seen the wind so high as that." 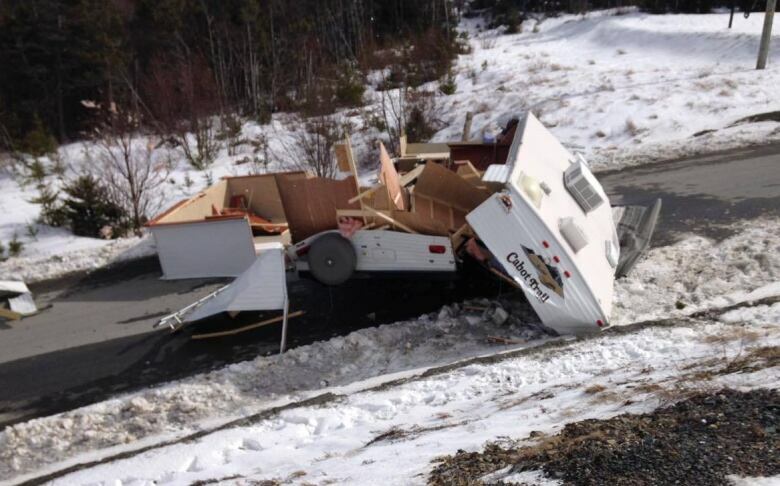 Courtney Howell of Grate's Cove, where winds reached gusts of 170 km/h, said the weather reminded her of hurricanes during her childhood in the southern United States. She said her neighbour's shed was blown away, houses have lost siding and she was without water Sunday morning because the well house blew over with the force of the winds. Howell said she took refuge in her bathroom because the wind was so strong against the windows of her home and debris flying through the air. "I've never been nervous with the wind, but I was very nervous yesterday. We're used to the windows kind of moving a bit, but the gusts were so strong ... you didn't know if something was going to hit the windows," she said. "At the peak, between two and four [o'clock] yesterday, we spent a lot of time just in the interior of the house — just in case." But, Howell said Grate's Cove is supportive in times of need. "The really wonderful thing about this town, everybody helps everyone out, so I'm sure it'll be a lot of that today." Newfoundland Power ends conservation warning; 8,600 still in the dark in N.L.